FightingArts.com - Koshi / Yao: Sad History, Bright Future? Editor's Note: This is another article in a series by George Donahue on the koshi/yao, body segments used to develop power and speed in old Okinawan Shorin-ryu karate the basics of which have been lost to most modern practitioners. 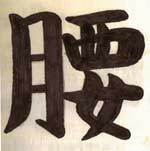 If koshi / yao is so important, why did it nearly completely disappear from martial arts? 1879 was a bad year for martial arts. In that year, the Ryukyu Kingdom came to an end and the Ryukyu Islands, including Okinawa, were formally incorporated into Japan. With that incorporation, a unique and valuable non-Japanese culture was subsumed and nearly erased entirely. The martial tradition of Okinawa was hit particularly hard. The old aristocracy of Okinawa was effectively disenfranchised. Karate, which had been an art of the Okinawan upper class, directly transmitted within families from generation to generation, was soon transformed to serve the needs of an expanding and militarily aggressive Japanese empire. Its public expression was purposely dumbed down for the masses; its private tradition was kept very private—almost secret—from prying Japanese eyes. It survived, but in a highly altered form. Much of what was quietly put away for better times was eventually lost, as better times were slow to come. As the karate masters who retained the knowledge began to die of old age, very few young experts succeeded them. Even before the formal incorporation, when Okinawa had been invaded and annexed by the Satsuma realm of Japan, there were early blows to the traditional way of teaching. Most important, and perhaps ultimately most disastrous, was the coerced separation of the art from its dual indigenous and Chinese roots. To survive, it had to become, or appear to become, Japanese. With the change of sovereign status came the conversion of the art from personal self-defense to mass fitness and military disciplinary skills. The people who had kept the tradition strong and vibrant were also ever more impoverished; the study of the old martial ways became a leisure activity—and leisure time was scarce. A similar misfortune befell the martial arts of China, although the process started earlier and took longer. When the Manchus conquered China and established the Qing Dynasty in 1644, the majority Han people kept their fighting traditions hidden away, waiting for the chance to redeploy them in rebellion. They had done the same four hundred years earlier, when the invading Mongols conquered and established the Yuan Dynasty, but the Mongols so quickly became Sinicized that it wasn’t necessary to keep the native culture repressed or hidden for long. There were many abortive revolts against the Qing, but the Manchus held power for more than 250 years. In that span, much was inevitably lost just from the passage of time. Each time the Han cranked up another unsuccessful rebellion, more of their skilled fighters were eliminated, and with their loss more knowledge slipped away. When the Han finally broke the Manchu grip at the culmination of the Boxer movement (1898–1901), they themselves had given up on the old ways. They had learned from painful experience that the internal arts were no match for cannons, rifles, and bombs. Worldwide, all old ways gave way to the new. In the 1800s and early 1900s almost every society, everywhere, enthusiastically jettisoned the treasures of their ancestors in the quest for the latest, greatest new ideas and toys. The pursuit of modernization, the quest for ever easier efficiency, the romance of capitalism, and relentless industrialization killed off folkways and folk wisdom everywhere. Particularly tragic was the irrational application of standardization to things that ought to have remained unique. Easy attainment became more important than slowly-gained expertise. Arts that were difficult to learn or master became redundant. They withered away, obsolete and forgotten. Anything that remained was killed off by the two world wars. By the mid twentieth century, comprehensive knowledge of koshi / yao was just about gone. Some knowledge remained, however, in out of the way refuges, in bits and pieces. Much of the knowledge of Okinawan martial tradition was preserved in such unlikely places as Uruguay and Argentina, where many thousands of Okinawans had gone in the late 1800s and early 1900s in search of better lives. The best-known example is Hohan Soken, the distinguished karate and kobujutsu expert who emigrated from Okinawa to Argentina in 1924, just in time to avoid the harsh militarization of Okinawa as Japan began its effort to control all of East Asia. Soken taught his old family knowledge to Okinawans in the expatriate community, preserving the traditions, maintaining and improving his personal skills, and promulgating the techniques. When he returned to Okinawa in 1952, the destruction was over and peace had gained a strong foothold. Upon his repatriation, he was possibly the only teacher left in Okinawa with substantial knowledge of the old internal ways. Those of us who have benefitted, directly or at a remove, from his return to Okinawa are fortunate that he was still young and vigorous enough, in his early 60’s, to teach for almost thirty more years. There were others, too, who had been able to maintain some knowledge. After the war, these people to a great extent pooled their information. It was a difficult task, in the face of general indifference, but they were steadfast—they knew the value of cooperation and they knew the true value of their treasures. A few eccentric younger students were able to learn from these remnants and reassemble the whole, or a good facsimile, with the help of their aging teachers and an improved understanding of physiology and body mechanics. Their number is still small, because much of the modern world—in Okinawa itself, in greater Japan, and in the rest of the world—has no time to devote to their art. In Okinawa, in particular, young students were not finding their way to the old arts, preferring instead to pursue flashier, competitive martial sports. For a time, my Okinawan teachers felt that the future of true martial arts lay in the West, as the Western students who came to Okinawa to study with them had far more fire in their bellies for the old ways than did the local youth. This is changing gradually, though, and maybe just in time. Nowadays, many students from the main islands of Japan come to Okinawa during their holidays to study and to try to recover the roots of their modern arts. Native Okinawan youths are also awakening to the value of their culture and finding the right places to study. Things are looking up a little for the authentic Okinawan martial arts. As with Okinawan karate and kobujutsu, a lot of the focus in contemporary Chinese martial arts is the search for the long-lost "internal" component. The core of this internal component for both is the understanding and manipulation of koshi / yao. And as with Okinawa, it was the expats who kept much of the knowledge from extinction. In China itself, the dynastic wars, the anti-colonial wars, and the civil wars wiped out much of the accumulated technical understanding. At the height of the Mao era, during the Cultural Revolution, it seemed as though all traditional Chinese culture, not just martial arts, might be exterminated. The re-established martial arts sanctioned by the Chinese government now are often not from the fighting tradition but from the theater, where acrobatics and flourish were valued above combat efficacy. Despite the obstacles of government policy, the arts are making a comeback. The catch is that the comeback is much stronger outside of China than within. The Chinese wanderlust, and the old Chinese practice of primogeniture, wherein the oldest son inherits everything and the younger sons have to move elsewhere to establish themselves by their own luck and pluck, has saved the day for Chinese internal martial arts. The Chinese who left home tended to concentrate in unofficial overseas Chinese colonies wherever they went. Many of them were and are diligent in preserving their cultural treasures, including the martial and healing arts. Thus, knowledge of the internal arts was kept alive in Malaysia, Indonesia, Singapore, the Americas (even such far-flung and unlikely places as New Mexico), Australia, and elsewhere while it was under siege at home. Unfortunately, there were no strong or unified cultural or martial organizations or movements. The surviving knowledge has often, until recently, been fragmented. Very few could legitimately claim to have anything approaching a complete picture. However, when the time came to attempt the restoration of technique and understanding, Chinese martial arts possessed an advantage over Okinawan arts. Okinawan kata, which were derived in large part from Chinese roots, were heavily modified to fit in with mainstream Japanese ideas regarding martial technique. In some cases, the original movements of the kata became distorted beyond all recognition. On the other hand, Chinese forms were not altered much at all. Much of the understanding of the forms may have been lost, but the forms themselves were preserved, as there was little need to conform them to any outside standard. What we see with the Chinese forms is that internal arts, because of the loss of understanding, became more and more “external.” External arts became more rudimentary and brusque; sometimes they became entirely empty of subtlety and came to rely solely on physical strength rather than technical prowess. But, because the forms do not have to be excavated from ancient tombs to then be dissected or reverse engineered (at least not as much) to discover their meaning, it’s easier for a student of Chinese martial arts with an understanding of the basics of koshi / yao to grasp the “secrets” of the movements. Chinese martial arts students and teachers tend to be diligent and extremely dedicated to their arts, and there is a long tradition of working at movement for years in order to discover the hidden meanings. Those hidden meanings turn out to have been not so hidden, all along. Now, throughout the world and particularly in China, Okinawa, Japan, as well as Korea, and the overseas communities established by emigrants from those sources, that process is being reversed. In China, the government has relented and given up repressing folkways and martial arts. These days the government even promotes pursuit of traditional martial ways, although its motives are heavily slanted toward commercial exploitation. With the world wide spread of the world wide web, we’ve entered a new age for sharing and recovering knowledge. In addition, cheap air transportation has brought a huge number of martial arts students access to teachers who were formerly too remote to reach. In Japan, the indigenous martial arts of Okinawa are at last receiving the respect and consideration they should always have had. In China, the arts that had been hidden away for so long and managed to survive are once again out in the open and beginning to thrive. It’s a good time to be student of martial arts.